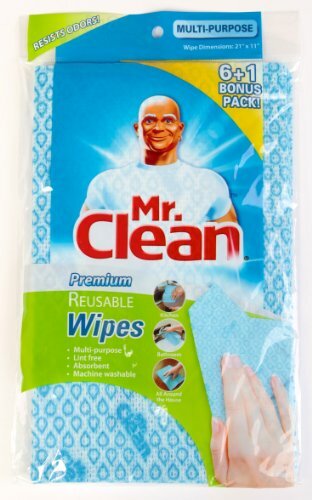 Mr. Clean Premium Reusable Wipes are made of 70% Rayon and 30% Polyester with dimension of 21 x 11-inch. These wipes are multi-purpose., 100% Lint free, Absorbent and machine washable. Use Mr. Clean Reusable Wipes to wipe, clean, dust, polish or scrub your cars, furniture, shoes, grills, computers, bathrooms, kitchens, windows, stoves, dishes, outdoor furniture, tools & much, much more! 21 x 11-inch muti-purpose resusable wipes. Resists odors. Soft & absorbent. Great for kitchen, bathroom and all around the house.